Slim Bodyline are a leading London provider of Arosha slimming bandage wrap treatments. The slimming wraps are a great way to lose immediate inches using bandages that are impregnated with quality ingredients that helps with cellulite reduction, toning, moisturising and water retention. Slim Bodyline provide express slimming bandage body wrap treatments in London. The Arosha wraps use prepacked disposable bandages for optimum hygiene, with each bandage being carefully impregnated with quality ingredients that aids cellulite reduction, toning, moisturising and water retention. We have a variety of bandages on offer to meet the needs of our clients, this enables us to tailor a specific solution for you. Aqua Drain bandages are used to significantly reduce water retention, which goes hand in hand with cellulite. It clears toxins and drains the lymphatic system, tones and firms the skin, as well as remineralising the skin, leaving it fresher, brighter and with better hydration. The Aqua Drain bandages are always used for your first treatment. Slim-Cel 3 bandages help to tackle cellulite and water retention. It will reduce excess water, as well as breaking down cellulite, promotes circulation, slimming, draining and moisturising. Cel-Term 4 is a thermal treatment designed to help slim the body by burning fat. It’s great for tackling Adipose Cellulite, and helps improve tissue elasticity, removing waste and stimulating fat metabolism. B-Batural are bandages designed for toning the bust and upper arms, improving elasticity and firming. Crio-Tonic 2 are cooling bandages designed to tone and firm the skin following weight loss. 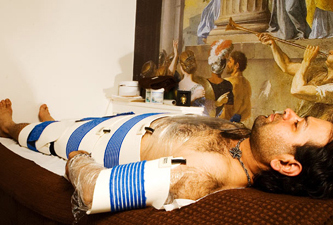 The treatment is designed to increase your metabolism and tone the skin. Body brushing stimulates the microcirculation, removes dead skin cells, aids lymphatic drainage, and aids the penetration of products. Used daily it will help reduce cellulite. Slimming Treatments are only available to individuals 18 and over. Completion of any waxing treatments should take place 24 hours before or after body wraps. The client should increase their water intake, and be aiming for 2 litres per day. This will help the body to flush out any toxins and prevent it from retaining water unnecessarily. For best results dry body brushing and moisturising should be completed daily. After Cel Term 4: No sunbathing/sunbeds/sauna/Jacuzzi/swimming for 2 hours after the body wrap.